AM Espresso is a great way to start your Friday off by expanding your customer base and unveiling new business leads. 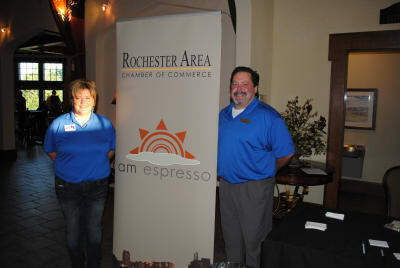 AM Espresso runs from 7:30am-9:00am and is a convenient way to network at various member businesses' while enjoying coffee and continental breakfast. This free, informal event will give you the opportunity to introduce yourself and your business to more than 100 Chamber members. Invite a friend and remember to bring lots of business cards! Interested in attending AM Espresso? Visit our event calendar for upcoming dates! For more information about hosting AM Espresso, please contact the Nick Rethemeier or call (507) 288-1122.